The modernization of a Museum District street corner is nearly complete. 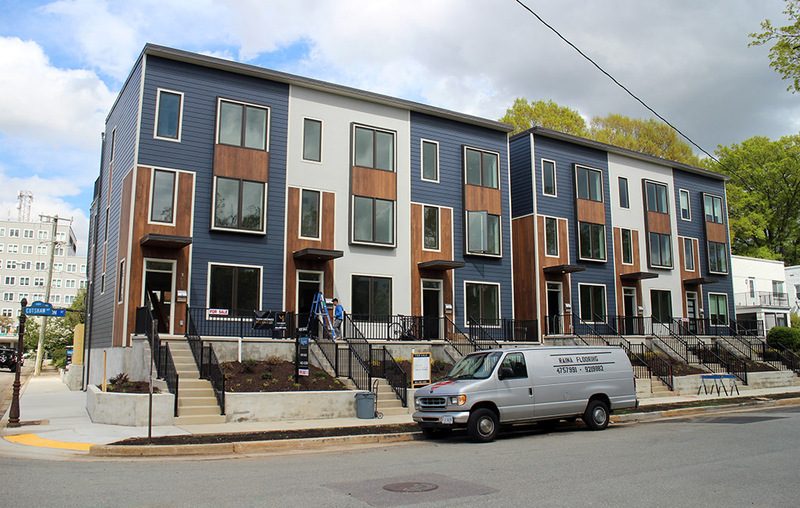 Carter Snipes’ Meridian development, a cluster of eight modern-style townhomes, is wrapping up at the intersection of North Thompson Street and Cutshaw Avenue. Snipes said work is finishing up on the project’s last two units, and three of its first four units recently sold, each with a sale price just shy of $500,000. Snipes, who developed the project, is selling the 1,800-square-foot units through his Snipes Properties brokerage. While the modern-style architecture is different for the Museum District, much of which was built in the early to mid-1900s, Snipes said the design provides more options for homebuyers with proximity to both that neighborhood and Scott’s Addition across Broad Street. The project’s name, The Meridian, was derived from that location, which Snipes said borders a Scott’s Addition ZIP code boundary and the edge of the Museum District. While permitting and weather delays pushed the project schedule back, Snipes said the development remained within its $2.5 million budget, financing for which was provided by Village Bank. Andy Scudder with Johannas Design Group is the architect on the project, and Williamsburg-based Lars Group is the site contractor. Richmond-based Kine Vue is the civil engineer, and Rob Stephens of River West Group is the construction administrator. Additional firms involved include locally based Rendersphere, which produced the project’s 3-D renderings. Patricia Holley handled interior design. Each of the units includes a rooftop deck and off-street parking. Snipes said the remaining units are likewise priced in the $450,000 to $500,000 range. Previous buildings on the site were demolished to make way for the project. Snipes’ firm purchased the 0.34-acre property in 2015 for $390,000, according to city property records. 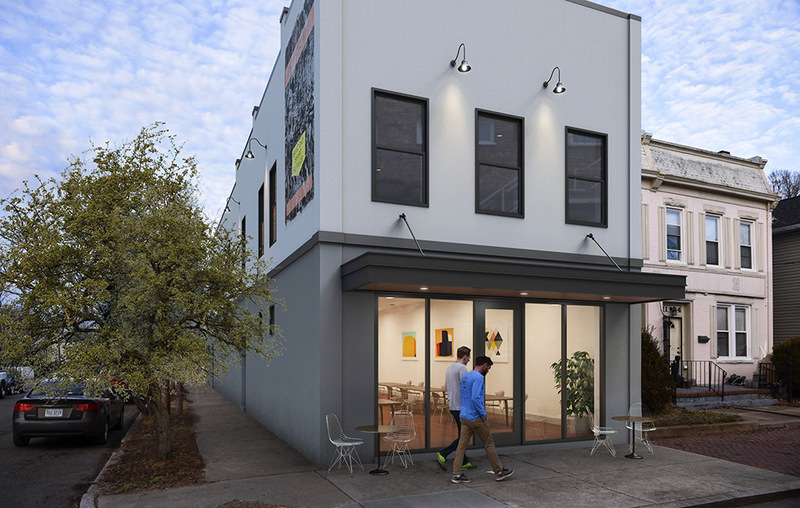 The Meridian adds to other investment and redevelopment occurring along the Thompson Street corridor, part of which – a row of six mid-century-style buildings along the west side of the street between Broad and Monument Avenue – was recently designated a state and federal historic district. One of those structures, a 20,000-square-foot former office building at 1004 N. Thompson St., is being redeveloped into primarily market-rate apartments by sibling developers Sarah and Mary Krumbein. Work on that project got underway earlier this year. Meanwhile, Snipes said he is getting ready to start construction on his next project: a conversion of the old Woody’s Inn building at 2128 W. Cary St. into two 1,000-square-foot apartments above a 1,700-square-foot restaurant space. Snipes said a tenant has yet to be secured for the restaurant space, which is being marketed by Martin Blum with Colliers International. The apartments will rent for $1,500 per month. Snipes said the project will involve historic tax credits and is budgeted to cost $350,000, with financing provided by Union Bank. 6 Comments on "Modern-style rowhomes wrapping up in Museum District"
Carter and Anne Snipes stepped out of their box to do this development and deserve the kudos and rewards for risk taking. Theyve done a beautiful job. And thanks for hiring Colliers Martin Blum, Richmonds foremost restaurant realtor, to fill the space at Woodys Inn! What’s up with our modern architecture in Richmond? It has got to be the most bland, boring, basic, and sometime flat out ugly, modern architecture on the East Coast. I think we need to bring in Canadian modern architects/design firms for any future work. Obviously just my opinion. I love modern architecture. Except in Richmond. We seem to always do it a disservice. Cool project nonetheless. Economics. The cost to purchase Meridian as a finished product is less than the the raw cost to construct a project by a firm like NatureHumaine in Canada. If they built to the specs of one of those projects, it would never sell/appraise, and the article would be about how expensive they were. If this project leaves your eyes sore like it does for my eyes, it’s just another reason to support the Old and Historic Designation overlay that protects some of our City’s historical architecture. Too bad the rest of the Fan voted this overlay designation down a few years back. Perhaps the Museum District should jump on board to protect themselves from McMansions and bland, ill-placed, and more common developments. These actually look really nice! Glad to see that area getting a facelift over time.